As war clouds gathered over Europe in the late 1930s, the U.S. Army asked Amer­i­can auto­mobile manu­fac­turers to tender sug­gestions to replace its existing, aging light-motor vehicles, mostly motor­cycles and side­cars but also (incred­i­ble as it seems) some Ford Model Ts. As early as 1937–1938, seve­ral proto­types were pre­sented to army offi­cials. 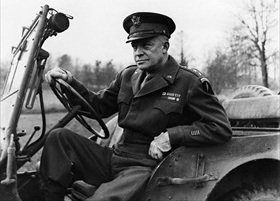 How­ever, army require­ments were not for­mal­ized until July 11, 1940, when 135 U.S. auto­mo­tive com­panies were approached to quickly sub­mit a design con­forming to the army’s specifi­ca­tions for an inex­pen­sive, robust, four-wheel-drive recon­nais­sance or com­mand vehicle. On this date in 1940 Karl Probst, a talented free­lance designer from Detroit, Michi­gan, accepted the chal­lenge. Five days later he sub­mitted a bid, com­plete with blue­prints. A proto­type, dubbed the “Blitz Buggy,” was hand-built in 49 days by the Amer­i­can Ban­tam Car Com­pany of But­ler, Penn­syl­vania, mostly using existing off-the-shelf auto­mo­tive parts. Tested in Septem­ber at the Army’s motor research and develop­ment facility out­side Balti­more, Mary­land, the vehicle failed only to meet engine torque cri­teria. The blue­prints, which the govern­ment claimed it owned under terms of the award, were turned over to Willys-Over­land and Ford Motor Com­pany. 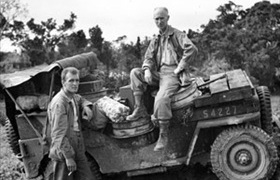 Both com­panies made design modi­fi­ca­tions, though the resulting proto­types looked simil­ar to Probst’s “Blitz Buggy.” The War Depart­ment, requiring a large num­ber of vehicles to be manu­fac­tured in a rela­tively short time, granted Willys-Overland the pro­duc­tion con­tract to build the vehi­cle for $648.74 apiece. Ford was licensed to manu­fac­ture the vehi­cles using Willys’ speci­fi­ca­tions. Between them, Willys-Over­land and Ford pro­duced about 640,000 of the legen­dary Jeeps, as the gene­ral purpose vehicles were called, a number repre­senting about 18 per­cent of all wheeled mili­tary vehi­cles built in the U.S. during World War II. “The world’s greatest fighting machine” saw ser­vice as scout vehicles, commu­ni­ca­tions vehicles, staff cars, and battle­field ambu­lances, among other utility chores. Left: The Bantam No.1 “Blitz Buggy,” the test vehicle delivered to Camp Hola­bird, Mary­land, on Septem­ber 23, 1940. “Old Number One” was the first vehicle of a 70‑vehicle con­tract between the U.S. Army and the Amer­i­can Ban­tam Car Company. Right: The BRC40 4×4 Light Recon­nais­sance Vehicle, the final evo­lu­tion of the Ban­tam design. Ban­tam built 2,765 of these nimble BRCs (Ban­tam Recon­nais­sance Cars), of which more than half went to the Brit­ish Army, while some were sent to the Soviet Union. 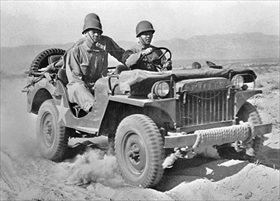 The term “Jeep” made its first appear­ance in print in late Febru­ary 1941, after Willys-Over­land staged a press event of its Jeep ascending the steps of the Capitol building in Washington, D.C.
Left: Willys MA Jeep at the Desert Training Center, Indio, Cali­for­nia, June 1942. 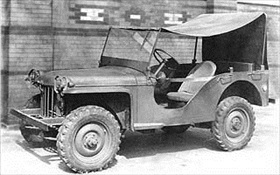 Most MA Jeeps were sent to the Soviet Union under the Lend-Lease pro­gram. 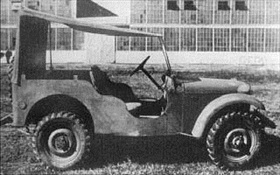 Willys made its first 25,000 1/4‑ton, 60‑hp MB Jeeps (for­mally, Truck, 1/4 ton, 4×4) with a welded flat iron “slat” radi­ator grille. It was Ford that first designed and imple­mented the now fami­liar and dis­tinc­tive stamped, slotted steel grille into its Jeeps. MB Jeeps were given other modi­fi­ca­tions, among them longer wheel­bases, 6×6 drive trains, skis, armor plating, rail­way wheels, and wea­pons mounts of various types. 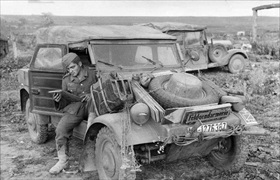 Right: A Volkswagen Type 82 Kübelwagen (literally, tub or bucket car) on the Eastern Front during Opera­tion Cita­del, June 21, 1943. In Janu­ary 1938 the Wehr­macht approached renowned designer Ferdi­nand Porsche of Volks­wagen Type 1 fame about designing an inex­pen­sive, light-weight, on- and off-road mili­tary trans­port vehicle, suggesting that his Volks­wagen Käfer (we know it today as the Beetle) could provide the basis for such a vehicle. Full-scale pro­duc­tion of the Kübel­wagen started in Febru­ary 1940. Between 1940 and 1945, 50,435 of these reli­able and dur­able vehicles with their air-cooled engines were pro­duced, including a Schwimm­wagen version.